I first came across this beautiful sight several days ago on my way home from work and today, armed with a camera, stopped by. In spite of traffic on the busy flyover, these seagulls on the railing and several hundred in the water below seemed to enjoy the sun, perhaps as a last adieu before departing Bahrain’s shores at the end of the winter. Strange are the ways of nature, indeed. Or why else would these majestic birds come to Bahrain in their hundreds of thousands every winter, escaping from the extremely cold weather in Northern Europe. And why now, when the sun is getting really hot and temperatures already touching 30 degrees C, they are not only still here, they seem basking in the desert heat! 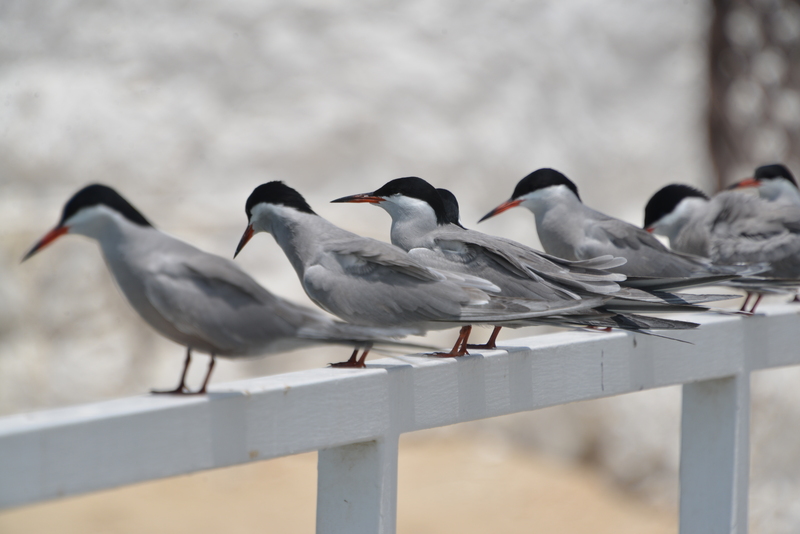 Bahrain, according to experts, has long been known as a pit stop for flocks of migrating birds, but until recently there was little scientific evidence to prove where they came from or where they were going. However, that changed in 2005 when Bahrain National History Society president Dr Brendan Kavanagh decided to launch the country’s first programme designed to track their movements. Now, years later, he and his fellow enthusiasts have managed to catch and “ring” birds of 130 different species – in the process giving a unique insight into the lives of birds passing through Bahrain. This has enabled them gain a lot of knowledge of bird movement, mortality and survival over many years. They say the migration routes from Northern Europe, through the Mediterranean and down the western side of Africa to Southern Africa, have now been mapped out piece by piece thanks to bird ringing.